This week I was invited to try a new delivery service in town- Door Dash . 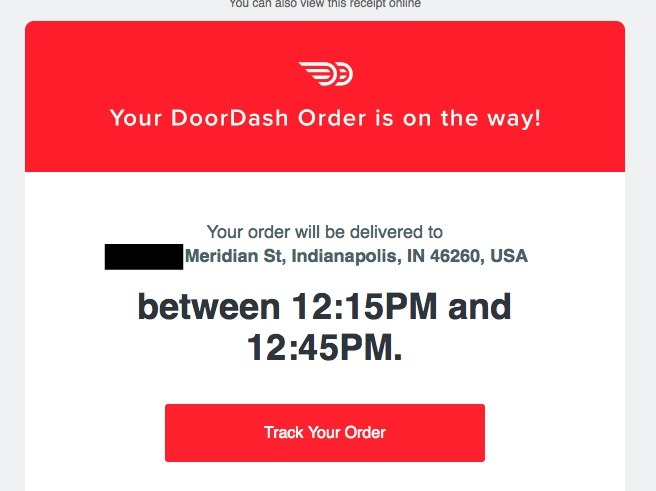 With locations in major metropolitan ares, Door Dash expanded to Indianapolis and Toronto this week. Door Dash brings food to your door quickly and courteously, and with it’s sleek app and website, you can follow your meal’s journey along the way. Door Dash is currently serving the northside of the city, and my office is conveniently smack in the middle of the delivery area. There are over 100 area restaurants from which to choose, including some that are a bit of a hike. The website will tell you the estimated delivery time, and if you want to be prepared, you can order before the service even opens at 11am. Thursday we ordered pizza from the Mellow Mushroom. The menu was easy to navigate, and the time estimate was right on. I got texts throughout the process, and was able to complete a one question quality survey after it arrived. Door Dash uses a sophisticated logistics system designed by Stanford PhDs. I’m pretty sure it makes the food taste better. Their mission is to empower local economies, which is noble, and I appreciate that they want to do so via food. Local restaurants increase their business, and Door Dash employees Dashers as well (the drivers). Want to give it a try? I’ve got a Promo Code for you- use GOTCHABABY and save $8 on your first order (And, every time you order, or refer a friend, you get credits to use on your next order)! Moe questions? Check out DoorDash.com for answers! Disclosure: Thanks for the great lunch, Door Dash Indy! We will meet again!